Ginny Baily, Editor of Riptide, describes how they gathered an alternative view of Devon for their latest volume. 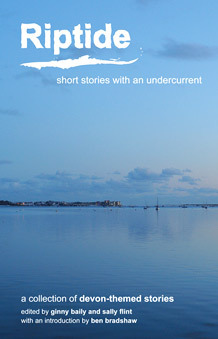 When Riptide short story journal agreed – in collaboration with Wordquest Devon – to produce a volume of Devon-themed stories, we were anxious to avoid the clichés – the cream teas, rolling hills, thatched cottages, cosy retirement to beach huts in seaside towns. We phrased our call for submissions carefully, talking about Devon as metaphor, imagined Devons, Devon from the outside as well as from within, and we cast our net wide. We feared, after six successful and varied volumes, becoming parochial. What we didn’t expect were tales that picked up these clichés and turned them on their head. There is nothing cosy, for example, about the retirement home that features in Martin Sorrell’s story ‘Going West’ which poignantly conveys the frustrated hopes of middle age amid the decrepitude and occasional fleeting joy of old age. Devon in this story is the place where “silly promises” are made, a sort of lost paradise, a metaphor for youth and beauty and impossible dreams. The beauty of the county emerges in these stories but there is always an edge to it. This is most evident in the depictions of Devon’s two moors. The Dartmoor where the main character in ‘The Wood Store’ by Ben Smith lives is intimately known to him, ‘every sheep-track, every mound of rock,’ but his moor is changing. Second-home buyers are moving in, forcing the locals out. Being able to name every wild flower in a patch of meadow or having an eye for the way the sun presses ‘itself like a pale thumb print into the mist’ is no match for the power of money. In Greg Hoare’s story ‘Inches’ a ‘market town in the folds of Dartmoor’ is the claustrophobic, dead-end setting. There are no prospects in this little town, no jobs. It is a place of Saturday night street fights. Dartmoor here becomes the place from which the young character Dylan wants to escape and London, where the money is, his aspiration. Judy Darley’s ‘The Beast’ is set on Exmoor, at a place where ‘the green grey strip of the moor … met the solid, unwavering purple of the sky’ and here the moor, not just its beauty but the power it has to catch the imagination, the myths and stories it has generated, is both a fearful place and a refuge. Normally we don’t set a theme for the Riptide stories but we have always found that one emerges as we make our selection – masks and what is behind them in Volume 3, summer slipping away in Volume 4, flight in Riptide 5 – as if the authors, unbeknownst to us, have been whispering in each other’s ears. Of course, there is nothing mystical about this phenomenon. It isn’t that the authors have been listening to each other but that their eyes and ears are attuned to what is going on in the world around them. This latent but always expansive theme then becomes the connecting thread of the anthology. This time, because we’d set a theme, Devon, we imagined that we might constrain or narrow the preoccupations of the writers and that the binding thread of the whole was dictated in advance. The opposite turned out to be true. We discovered, in fact, that we had given the authors’ licence to let their imaginations soar – a reminder that restrictions can be one of the best ways of sparking creativity as anyone who produces their best meal out of what they can find in the store cupboard can testify. Devon in these stories is the backdrop against which the writers communicate contemporary reality, the zeitgeist or spirit of the moment, and what they tell us is what we already know: that times are hard. Jobs are difficult to come by – whether you’re fresh out of school like Greg Hoare’s Dylan or joining the swelling ranks of the unemployed graduates like the characters in Luke Kennard’s ‘Freaks of Nature.’ From Sorrell’s old people’s home crooner to Shohidur Rahman’s ventriloquist who had ambitions ‘to enter the larger world, with its lights and luminaries,’ compromise, making do, letting go of dreams, colour the lives of many of the characters who people this collection. There is nothing twee or picture book about the Devon portrayed in these stories. The dead bodies alone should alert us to that fact. There are five strewn among these fifteen tales: two murders, two manslaughters (one of them open to question) and one ‘slow suicide’. But the book, far from being a depressing read, is a powerful and, ultimately, an uplifting one. By bestowing its unflinching gaze on our life experiences – in all their joy and suffering – but doing so through the filter of Devon, something transcendent and timeless is revealed. At the heart of this collection there is a story, a piece of memoir, by our oldest ever contributor, Roland Tuson, 88. He recalls the daily struggle and poverty of his childhood in Exeter 80 years ago. His story sings with the joy, sunshine and adventure of life, the sparkling beauty of the river, the way it ‘provided a huge adventure playground’. His story is a reminder that hard times are not new and that perhaps Devon, with its timeless core of granite, is uniquely well placed to remind us that nothing lasts forever. Riptide is a bi-annual anthology of new short fiction by both established and emerging writers. Find out more on the Riptide website. This entry was posted in Uncategorized and tagged devon, journal, literary, literature, riptide, short story, writers, writing on 2nd Mar, 2012 by rwfm201.